We offer a wide range of consoles for a wide range of manufacturing purposes. Our consoles are customizable. Discuss your needs with us and we will deliver consoles according to the dimensions you require. Our affordable console solutions can help you with a number of processes. We understand that Fiberglass is the ideal alternative to metal due to its low price and durability. Our engineers work hard to come up with fiberglass consoles that serve a number of industrial functions, enabling you to carry on production at an affordable rate without compromising on efficiency. 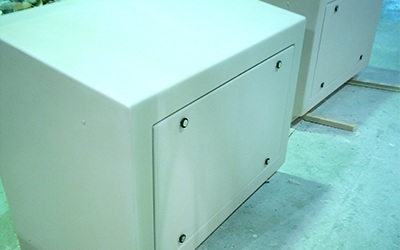 The key benefit of using the fiberglass consoles we manufacture is that they are lightweight and you can have them customized and designed to any shape or size. This versatility and flexibility sets our consoles apart from other fiberglass consoles you will find on the market. 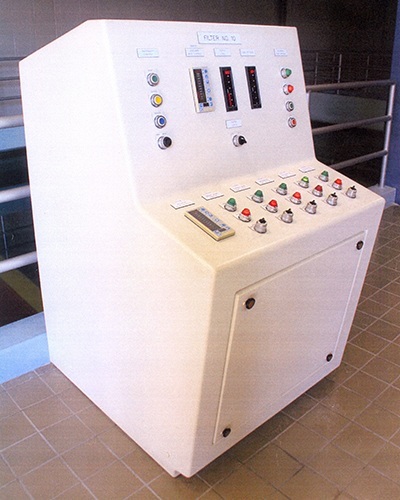 Our process for producing fiberglass consoles is simple. We combine a range of techniques, including infusion and open molding, to enhance the durability and strength of the fiberglass. Once the material is ready, we mold it into the shape and design you are looking for. Our team of experts is well-versed with the diverse needs of fiberglass in industrial processes. Therefore, we go the extra mile to deliver consoles that not only serve your purpose but also provide you great value for your money. We mold in the colors to the consoles. This means that you don’t have to worry about maintenance at all. The colors will not fade or wear off, even with wear and tear. Our consoles are also easy to maintain, reducing the hassle for you. All consoles are available in three width options, including 36 inches, 48 inches, and 66 inches.